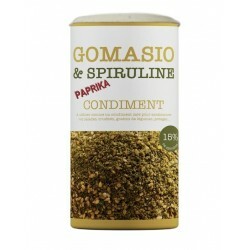 To use in replacement of salt, Allows to reduce the consumption of salt in the food. Condiment made with unrefined sea salt, whole toasted and finely crushed sesame seeds on a stone grinding stone to prevent heating, low-temperature spirulina and sweet paprika. These manufacturing processes allow this gomasio spirulina and paprika to preserve all its original nutritional richness. Reduces salt intake in your dishes.